Women were held in high esteem and were offered protection; teachers were noble and were offered the highest place of prominence in the society; holy saints and sages were really holy and behaved with dignity as the true messengers of God..
Money was earned through hard work and not by exploitation; scriptures in the holy texts were accepted as statements of God; every citizen was selfless and struggled for the well being of society; governance was honest and the protectors were brave.. In both these yugas,the common man was always under the protection of the king so I had very little to do except interfere at a time when I felt there’s a threat to that king,to humanity and to peace on earth.. But, on the contrary, in this sin filled Kali Yuga, everyone will be in a problem and everywhere there’s going to be a problem.. Holy Sages like you shall remain confined to ancient texts; stupidity will start defying devotion towards God; human life will be valued in terms of money and human relations will be traded in a barter system . Schools of learning will become tools for earning; teachers will become objects of mockery; married women will be subjected to domestic violence; young women will be treated as objects of carnal desire; mother and father will be treated as a door mat and a watch dog; friends will no more be friends and relationships will be born out of necessity; and God men become more powerful than the Gods..
There’s going to be one portion of dharma still left in this kali yuga which means there will still be a few good people left among these in-humans.. These people, despite waging so many battles in their personal life,would always try to tread the noble path of righteousness.. These people will be in problems but still try to help others in problems;these people will be starving for food but still try to offer food to those who are starving;these people often have grief inside them but still wear a smile on their lips to keep those around them happy..Am always there for such people and such people are always so dear to me.. I shall mot mind if these people do not come to my Temple; .I shall not mind if these people do not offer me any prayer; I shall not mind if these people do not utter my name at least once in their lifetime.. But Who Is That Holy Sage And Why Did Lord Sri Venkateswara Said So..
Before that it’s important for you to know that the complete place of Tirumala and the place around these seven hills are part of the Telugu speaking land of Trilinga Desa (Land of the Trilinga Kshetras or Three Siva Linga Kshetras of Kaleswaram in Telangana, Bhimeswaram in Andhra and Srisailam in Rayalaseema).. Therefore for over many centuries now, Telugu has been the spoken language in all the areas of this Trilinga Desa (current day Andhra Pradesh and Telangana states) including those areas around the Tirumala hills.. Right from those ancient days to this current day, Telugu is the official language of the holy Tirumala Temple which is why many ancient stone inscriptions here are found mostly in Telugu language.. It is claimed by many historians and scholars that Telugu was the major language of communication those days when Lord Sri Venkateswara existed in the areas around Tirumala Hills in human form as Lord Srinivasa.. Many holy sages and kings who interacted with Lord Sri Venkateswara,in those days,spoke with Him only in the language of Telugu.. Which is why the entire conversation between Lord Sri Venkateswara and sage Agastya maha muni in the following amazing incident was in Telugu too..
Lord Srinivasa once went to the hermitage of Sage Agastya and said”Munindra.. I have come to Bhu Loka (earth) on a particular mission and going to stay here till the end of the Kali Yuga.. Am very fond of Cow milk and need one for my daily needs.. I know you have a large Gosaala with many Cows..Can you offer me one Cow for my needs..”..
Lord Srinivasa smiled and said, ”Ok Munidra.. I Shall certainly do what you wanted me to do.. ”and returned to His place..
Later Lord Srinivasa married Goddess Padmavathi.. Some days after their marriage Lord Srinivasa came to sage Agstya maha muni’s hermitage along with His divine consort Padmavathi to seek the holy Cow.. But the sage was not there in the hermitage.. His disciples who do not know who Lord Srinivasa is asked Him.. The Lord replied, ”My name is Srinivasa and she’s my wife Padmavathi.. I asked your acharya to offer me a Cow for my daily needs.. But he wanted me to come along with my wife and take it.. So I have come now.. Will you please inform your acharya that I have come..” said Lord Srinivasa..
“Our acharya is not there in the ashram (hermitage) right now.. So please come again later to collect your Cow..” said the humble disciples of Sage Agastya.. 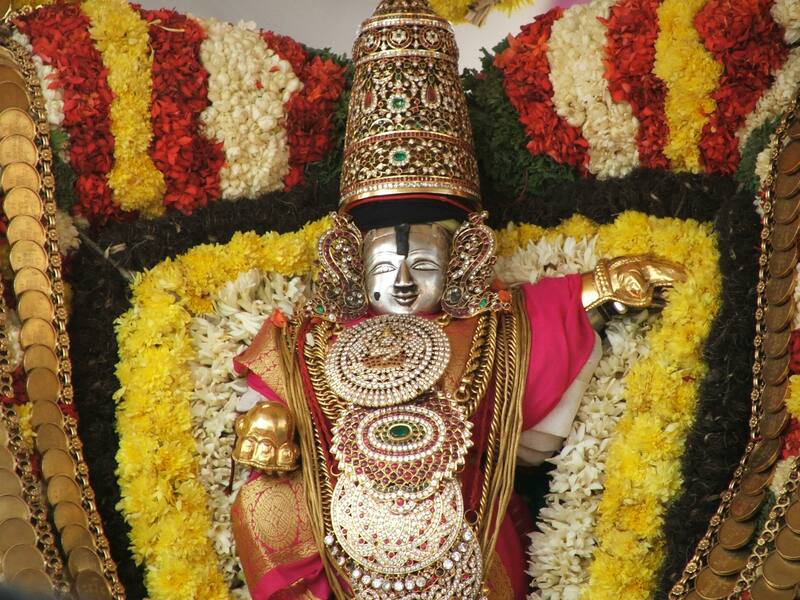 Smiling gently, the holy Lord said, ”..I value your respect towards your acharya..Please convey him when he returns,that Srinivasa had come from Gnanadri hills along with his wife to seek the Cow from him..” ..
Saying so Lord Srinivasa turned back and started walking towards the seven hills of Tirumala.. Exactly after a couple of minutes, Sage Agastya returned to the hermitage and was extremely disappointed when he heard from his disciples about the arrival of Lord Srinivasa during his absence.. 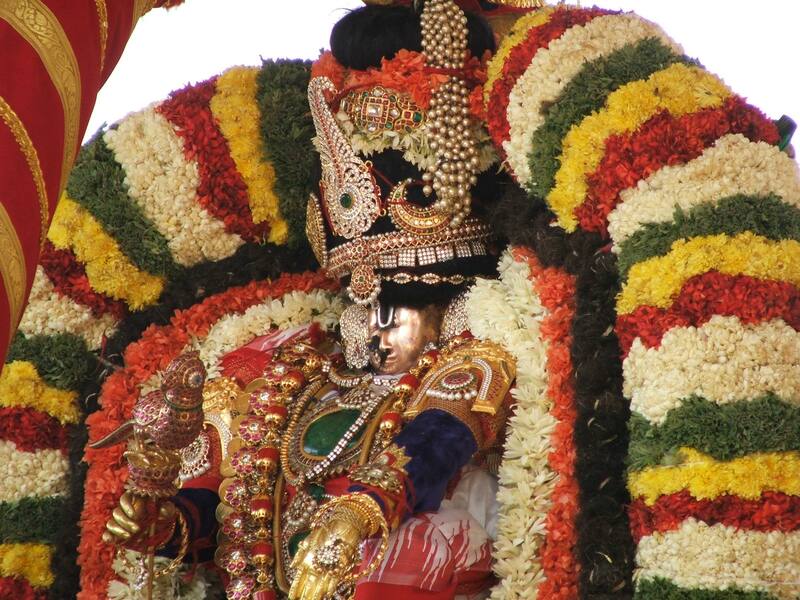 Thinking loudly, ”how unfortunate really am not to be there at the hermitage when Sri Mannarayan Himself graced along with my divine mother Lakshmi”, the holy sage immediately rushed into the Gosala (Cow shed); took a Govu (Telugu word meaning Cow) and started running in the direction Lord Srinivasa and Goddess Padmavathi were going.. But the Lord didn’t turn back.. Increasing the speed of his running, the Sage Agastya started shouting further more loudly.. The Lord still didn’t turn back.. This time the holy sage not only increased the speed of his running but also the speed of his shouting..
“..Swamy Govu Inda.. Swamy Govu Inda.. Swamy Govu Inda. Swamy Govu Inda.. Swamy Govu Inda.. Swamy Govu Inda.. The Lord still didn’t look back..
Hurriedly increasing the speed of his shouting, the holy sage from here on started involuntarily saying the following sacred words.. The noble sage thought he was saying ‘Swamy Govu Inda’ but see what it turned out to be..
“Please remember Munindra, every time I’m called by this name you are remembered too.. If any devotee for whatever reason is unable to come to my Temple I shall still grant him whatever he rightfully deserves if he recites just this name GOVINDA as many times as he’s comfortable chanting..”. Loaded with the Divine blessings of Lord Venkateswara and endowed with many miraculous powers, my recently released book God On Call (English) is a powerful book with twelve spellbinding true stories based on real life miraculous incidents that occurred in the lives of some extraordinary personalities like Swamy Sri Rangnathananda of Ramakrishna Mission, Music Queen Smt.M.S.Subbulakshmi and Carnatic Music Maestro, Sri.Rallapalli Ananta Krishna Sarma. Please Click Here to buy this life changing book on our eCommerce website.. Released on 24th March, 2017, this book is going all over the world today, changing lives, and is also receiving amazing reviews on Amazon where it was recently listed. You may Click Here to buy this book on Amazon and also to read the amazing reviews it is receiving from readers.